It’s the same tragic story. Another unarmed Black man is killed by the police. Another White man takes an arsenal into a school, campus, or place of worship before opening fire on unarmed innocents. The media takes these headlines, packages them together with thoughts and prayers, and uses the ratings to continue peddling their editorializing as news until another such event inevitably occurs yet again. And what do we have to show for it all? Besides a growing anger at the political injustices and vile rhetoric of those with power causing some push back for the media to ultimately dismiss, the answer is complacency. In a world turned flat by the internet, tragedies become commonplace enough to forget. Death becomes the norm and life the surprise. 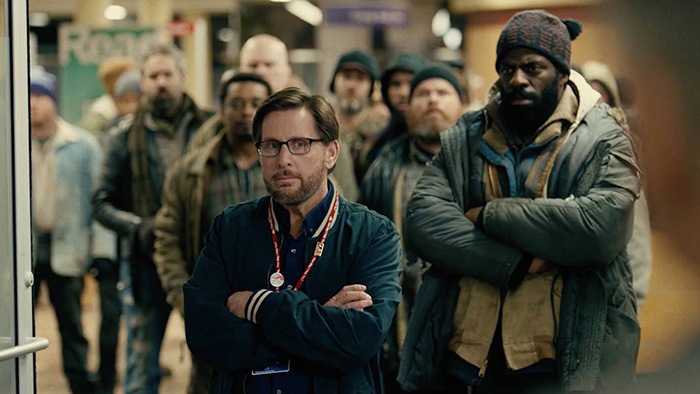 Emilio Estevez taps into that anger with his latest ensemble drama The Public. He’s taken the structure of Bobby with overlapping narratives that converge upon a single locale and combined it with the philosophical impulse that drove The Way. As such it proves less about incitement (what many other films use to exploit tragedies and their subsequent causes in order to bank on making the choir weep while detractors simply bolster their opposition) than understanding. It’s a bold task with many moving parts including but not limited to the exposure of police brutality as precedent, media sensationalism, ineffective fair weather meme-activism, and the unfortunate reality that upholding the law is oftentimes an implicit sanctioning of dehumanization. The result isn’t perfect, but its heart is in the right place. The venue is the Cincinnati Public Library: a safe haven not just for the freedom of information, but also the lives of the city’s homeless population. Should librarians need to worry about whether or not removing a patron for complaints of bad hygiene is a human rights violation? No. But like so many other government-run public institutions that are understaffed and underfunded, that’s exactly the position they’re thrust into. So Stuart Goodson (Estevez) and his staff (Jena Malone’s Myra and Jacob Vargas’ Ernesto) must find the balance between providing literature to all those who ask and ensuring the safety of all those who enter their door. In the process they discover their always-expanding job description also includes putting heads on the chopping block whenever a scapegoat is needed. Only upon realizing this unwritten truth can one step back and recognize his/her position. Is taking public transportation enough to assuage one’s guilt about his/her carbon footprint when human beings are literally dying of exposure during an unprecedented cold snap (itself a paradoxical result of too many not feeling that guilt)? Estevez creates a couple Ebenezer Scrooges in prosecutor (and mayoral candidate) Josh Davis (Christian Slater) and to a lesser extent negotiator Detective Ramstead (Alec Baldwin) to stand with law and order—a side that inexplicably lets the most desperate of our population down. They see the homeless staging a sit-in at the library as ungrateful despite the shelters they direct them towards being full. They see a human rights protest as a potential accountability floodgate opening wide. The media doesn’t help as Rebecca Parks (Gabrielle Union) would rather keep the spin Davis spun about this peaceful demonstration being a hostage situation since it means more viewers and more hits on her social media brand. Suddenly everyone fears the worst. They dig up dirt on Goodson to paint him as a villain because he’s the only person involved for which they have a name. Those who actually organized the impromptu event are the downtrodden they try not to look at when walking down the street. 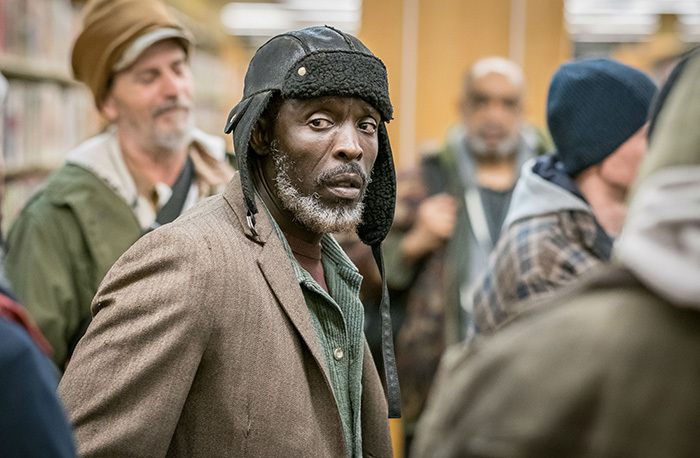 It doesn’t matter that Jackson (Michael K. Williams) and Suits (William Cross) are veterans. It doesn’t matter that Big George (Rhymefest) is mentally ill. When an unsolicited caller screams to “let them all die and clean up the streets,” we understand. What would it cost the city to designate the library as an emergency shelter when the weather dips below freezing? Enough to warrant finding a dead body that full-time employees recognize by name as a harmless man who made them laugh? This is the question asked of Goodson’s boss Anderson (Jeffrey Wright) once he becomes positioned between law and morality. There’s the desire to blindly follow rules and appease the state when conflicts arise that Davis demands and the righteousness of Goodson for willing to take a stand with those who have nowhere else to go by reminding people what our public institutions represent. Goodson’s past and present may provide added context for his choice, but you’d still wish it wouldn’t be so hard for everyone else. Estevez delivers a lot more to color the proceedings with Detective Ramstead having a junkie son who may just be one of the protestors locked inside Goodson’s third floor section, Goodson finding a romantic connection a day before the chaos begins in Taylor Schilling’s Angela, and the mayoral race pitting Davis’ hard-liner who acknowledges he doesn’t come off as the “nice guy” he believes he is against a pastor who cares about nothing more than those people his opponent treats like animals. The writer/director/star may have bitten off more than he can chew with many plot threads proving underdeveloped and blatantly used to set-up future actions, but we never feel overwhelmed. This two-dimensionality may actually help prop Goodson, Jackson, and the rest up as the heroes they are. There’s a definite agenda on display too, but that’s kind of the point. We’re supposed to see how quick people lucky enough to never have needed to experience what it means to live on the street are to vilify innocents who weren’t because doing so upholds their skewed worldview. Goodson is allowed to be self-righteous and smugly intellectual (he quotes Grapes of Wrath to an ignorant Parks during a live interview with her believing he’s just corroborating her baseless claim that he himself is mentally unstable) because those confronting him refuse to use reason above force. Estevez isn’t afraid to swing for the fences and elicit some tears from empathetic audience members, but he’s also willing to stop himself short of full-on exploitation via senseless violence. That’s what makes The Public a success despite the convenient characters and constant paralleling showing the merit of second chances. Estevez never forgets the humanity he’s striving to spotlight. His goal isn’t therefore to paint police as monsters by letting them unleash their wrath so he can linger on the beat-up and bloodied faces of the innocent while a melodramatic score plays. He knows that method doesn’t work. Instead he lets the police have complexity with the room to realize the error of their binary protocols and allows their would-be victims to bare their souls and prove without a shadow of a doubt that they mean no harm. It’s now those confrontations ending without bloodshed that we remember most because they’re sadly the type we too seldom see. 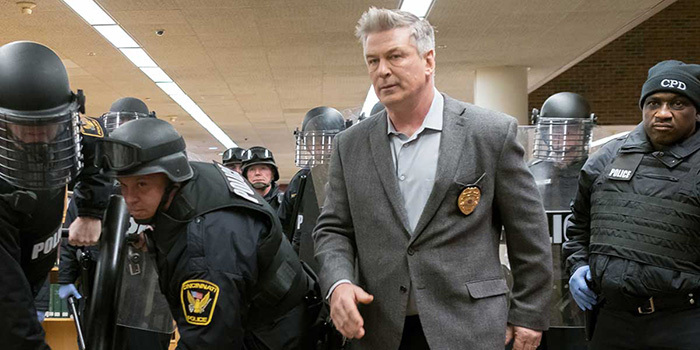 The Public opens in limited release on April 5.